This is a comfort food dish from my childhood that I love even to this day. It would make appearances on potluck dinner tables, a welcome reprieve to all the traditional Bengali dishes like pullao, korma, dal, vegetables, various beef/chicken/fish curries. I also remember eating it for lunch with my cousins when we’d go visit our relatives in Bangladesh. One of my aunties made it for my baby shower last year and I wanted to inhale the whole platter. What exactly makes it Bengali-style? No clue, other than the fact that variations of it are made and served in Bengali households the world over. 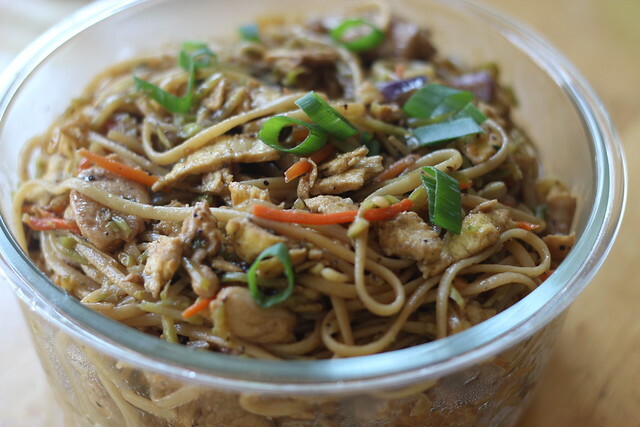 It’s a simple dish, just noodles sautéed and tossed with pieces of chicken, veggies, and omelet strips in a mix of soy sauce, black pepper, garlic, ginger, and some sesame oil. I’ve even had it with pieces of cooked sausages/hot dogs and pieces of cooked potato — that is definitely a Bengali thing, we like adding potatoes to things. I’m not sure what exactly made me think of it recently. It was probably a combination of the sad news from Bangladesh that made me think back to our childhood visits, missing my family on Eid, craving carbs like crazy because I was trying to limit them to lose some weight, and wanting to make it for Baby N, who happily ate some when we were visiting relatives over Memorial Day weekend. Feel free to play around with the type of noodles (try spaghetti, linguine, Chinese egg noodles), vegetables (broccoli slaw, French-cut green beans, julienned carrots or peppers), and protein (omelet strips, chicken, sausages). Don’t be too alarmed by the amount of soy sauce — you are seasoning a lot of noodles and vegetables and quite honestly, the soy sauce is what makes the noodles so good. And don’t forget the black pepper, that’s also key! Since these noodles taste great at room temperature, they make a great contribution to a potluck or picnic! I was recently given the opportunity to play around with OXO’s 8-piece SNAP Glass Round Container set, as well as their 2-in-1 Salad Servers and Little Salad Dressing Shaker as part of OXO’s SNAP Into Summer campaign, and these are perfect for those summer potlucks or picnics. I love the look of the clear glass with the bright teal in the rim of the lids, and the containers weren’t too heavy to hold. The set consists of 1-cup, 2-cup, 4-cup, and 7-cup containers and corresponding lids. The 2-in-1 Salad Server worked great to serve the noodles – there’s a button at the top that you can push to change the configuration from tongs to single-use, though I found it a bit difficult to push. 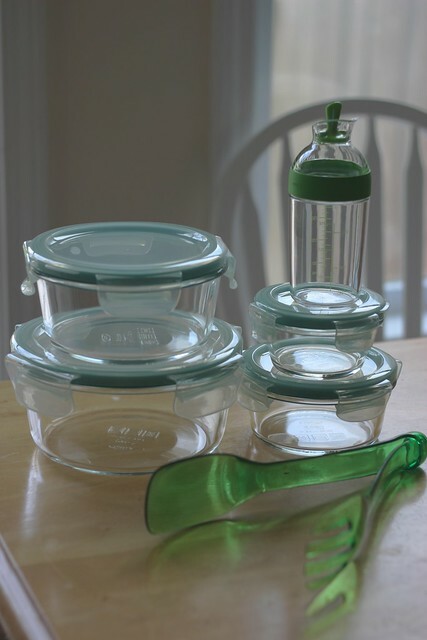 Overall though, I feel like the glass storage containers and the salad server will get a lot of use. I’m trying not to use plastic as much for food storage, so having a BPA-free option is good. But what I like most of all is how beautifully they show off these noodles! *Disclosure: OXO provided me with the 8-piece SNAP Glass Round Container set, as well as a 2-in-1 Salad Server and a Little Salad Dressing Shaker as part of their Blogger Outreach program. All opinions are my own. While water is coming to a boil, make the omelet strips. Heat 1 tbsp. oil in a frying pan over medium heat, then add beaten eggs. Make a quick omelet and fold into thirds. Slice into julienne strips and set aside. Once water has come to a boil, add the pasta and cook for amount of time indicated on box. While pasta is cooking, take a large deep skillet and heat 2 tbsp. oil over medium-high heat. Add sliced green onions, reserving some for garnish, then the garlic and ginger and cook for a minute or two. Add the chicken pieces, seasoning with black pepper and 1 tbsp. soy sauce. Cook until no longer pink. Add the vegetables to the chicken and add 1 tbsp. soy sauce and the oyster sauce if using. Stir fry until veggies begin to soften. Once pasta is done, drain and return to pot. Depending on how deep your skillet is or how big your pot is, you can either dump the pasta into the skillet or dump the chicken and veggie mixture into the pot. 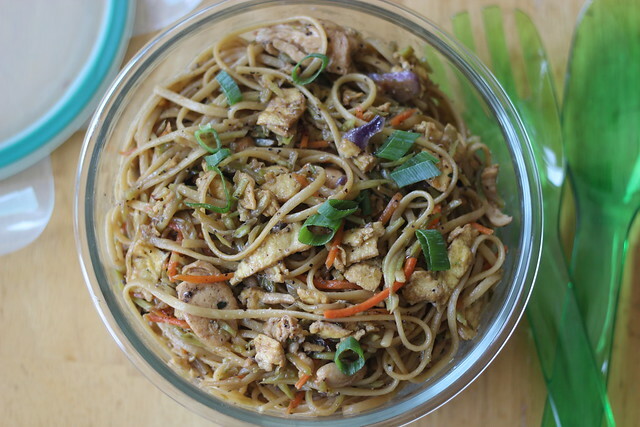 Either way, combine noodles with the chicken and veggies, adding more soy sauce and black pepper as needed. If needed, add more oil to prevent noodles from sticking. Carefully add omelet strips and adjust seasoning once more. If using sesame oil, add and give noodles one last stir. Garnish with remaining sliced green onions. Enjoy! Can’t go wrong with Chinese style noodles, favorite with old and young! !